Elizabeth Manning Murphy DE, Distinguished Editor and Honorary Life Member of the Canberra Society of Editors, and Hilary Cadman AE, Accredited Editor, have collaborated to produce a new edition of a book that has been much loved by writers and editors for 25 years. This edition is right up to date, with help in writing emails, writing for websites, text messaging and so on, all in the authors’ familiar friendly style and still with an emphasis on the basics of good writing and effectiveness in workplace documents. The book will be launched by special guest and friend of the Canberra Society of Editors Jack Waterford, editor-at-large at The Canberra Times. Speakers will include the president of the Canberra Society of Editors, Alan Cummine, publisher Linda Nix of Lacuna Publishing, Hilary and Elizabeth. 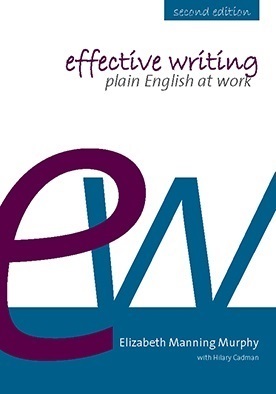 Copies of Effective writing will be on sale at the launch at the special price of $30.00. If you miss out on the launch, Elizabeth will be talking about her many books at our next general meeting on 30 July – her two latest books will be on sale at the meeting: Working words (pub Canberra Society of Editors), special price $36.00; and Effective writing, special price $30.00. Watch for a notice about this meeting on this page and on the website.